Just starting out. Do I get these or are they crap & simple foam plugs would be better? Last edited by uk_exile; 03-03-2019 at 08:17 AM. Better off ordering Howardleights IMO. With either I would wear foam plugs underneath if there's a lot of shooting going on, or if shooting from under cover. You can still hear conversation through the plugs when there's no shooting. These are both Class 4 vs 5. Hunter_killer and Cordite like this. Or go full balls on Peltors. Save all the micro transactions in between lol. But they pack a pretty hefty tag. shooternz and xtightg like this. Savage1, Mathias, Hunter_killer and 1 others like this. First pair I bought a few years ago were same as the ones mentioned on sale from GC. Did the job but budget quality and carked it last year. Now have a pair of these howard leights and they great value for money. Much nicer to use. Peltors off Amazon, not dear at all. Buy Peltors, I find those Howard’s don’t fit very well. Yes, definitely wear ear plugs inside. I use Howard Leights and as Tommy says you can hear fine wearing plugs underneath thanks to the electronic amplification. The ear plugs especially save the day when you wear safety glasses which make a good ear muff seal difficult to get. It only takes one or two shots for you go go home with tinnitus, cumulative hearing damage. I believe the Howard Leights don't seal as well as Peltors, reason I went with the HLs as they are flatter, supposed less interference with cheek weld. Either way, wear plugs under them. Last edited by Cordite; 03-03-2019 at 11:03 AM. Sadly I feel I am about to make a large donation to the nice people who provide hearing aids, I suffer tinitus and years of workplace noise are now causing me issues. 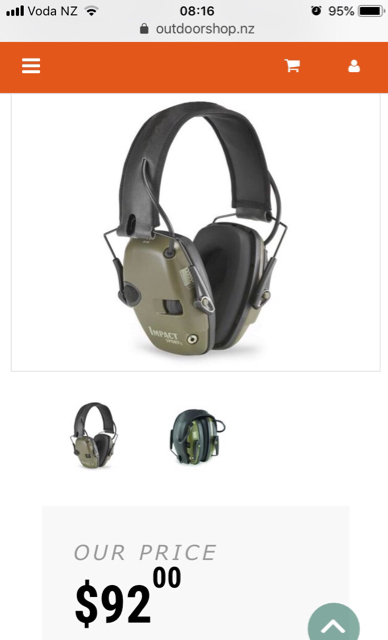 Even though I have always worn highest grade of earlugs (I believe 33db) I think they are not 100% effective when you are working 8-10 hours at a stretch in noisy places. Even now I stare in wonder at the number of painters chipping paint of ships hulls using needle rattle guns and no earing protection at all!! Buy the best protection you can even it its expensive, tinitus is not nice and having to ask your better 1/2 to constantly repeat herself causes issues or worse when you don't hear her at all because she is not directly facing you!!! Seventenths, spada, Ruger7mm and 3 others like this. mikee and Steve123 like this. Thanks all. No GC 50% off muffs then!